Krunal Pandya and Dinesh Karthik could not quite toe their side over the line with 16 needed off the final over on Sunday, 10 February, after numerous Indian cameos had kept hopes alive for Rohit Sharma’s men. New Zealand’s destructive batting display, headed by an imperious Colin Munro, was in the end the difference between the two sides. It is India’s first T20I series defeat in their last ten efforts. The hosts made light of the Indian bowling attack, Hardik Pandya (0/44) and his brother, Krunal (0/54) both emerging with undesirable figures. Munro was the main culprit, blasting a 40-ball 72 from the top of the order with five fours and as many sixes. Put in, Munro and Tim Seifert got off to a flyer, striking to all parts, running away to 80 in just the eighth over. The impressive Kuldeep Yadav, though, had the latter stumped with the help of MS Dhoni for a rapid 43 from 25. Kuldeep helped slow down proceedings somewhat following the Powerplay, and his contribution became more crucial when he had Munro caught on the boundary in the 14th over. But, once he’d bowled his maximum four for an impressive 2/26, the seamers could not rein in their opponents in the last six overs. Kane Williamson was caught swinging for 27 as Khaleel Ahmed (1/47) picked up his solitary scalp, before Colin de Grandhomme once again showcased his devastating finishing abilities. He followed up his blistering half-century from the second T20I with a 16-ball 30, before departing in the penultimate over, having pushed his side up to the 200-mark. Ross Taylor (14*) and Daryl Mitchell (19*) then took 19 from the last 10 balls, leaving Sharma’s men requiring a menacing 213. India’s reply began in poor fashion, Shikhar Dhawan (5) slog-sweeping Mitchell Santner (2/32) to the man at deep mid-wicket in the first over, but Vijay Shankar once again showed his metal for India from No.3, putting on a quick-fire 75 with Sharma before being caught in the deep for 43 from just 28 balls. Rishabh Pant pumped two of his first three deliveries into the stands, having spanked his first ball for four. Blair Tickner (1/34), the 25-year-old seamer who looked handy on debut, then picked up his first wicket in international cricket, quelling Pant’s (28) threat early by having him caught in the leg-side infield. New Zealand’s squeeze then hit full flow, as stalwart Sharma edged off to Mitchell for a reasonably measured 38, and Scott Kuggeleijn sent Hardik back for 21 after a couple of big hits. Mitchell’s (2/27) second wicket was then arguably as vital as that of Sharma’s, forcing a huge, spooned slog from Dhoni (2) that was snaffled, leaving the away side flailing on 145/6 and requiring a further 68 from 28 balls. With Karthik the only specialist batter left in the bank, New Zealand could scent series victory. However, when Tim Southee went for 18 in the 18th over as Krunal found his flow with the bat, India began to believe. A maximum each for Karthik and Krunal in the 19th then left the tourists with 16 to win from the final over, and the expensive Southee was the man tasked to bowl it. Unlike his prior offering, Southee (0/47) then found his primed yorker-length with some wicked death bowling, serving up a spectacular contribution to restrict India to five from the first five, before Karthik sent a consolation six into the stands with the last ball when the game was already out of sight for India. A grand series victory for New Zealand, but it was once again a magnificent display of hitting from both sides. Colin Munro, Man of the Match: Touch and go there until the final minute. India – you get one good batsman, another one comes along. The boys did a really good job of finishing off the really good Indian batsmen. Didn’t really focus on trying to do anything different, tried to put pressure back on the bowlers. Just came out nice and free, had a bit of luck, which you certainly need in this match. Tim Seifert, Man of the Series: Great to have a performance like that, but it’s great to get a victory, particularly a last-minute one like that. Great to have batted with Colin Munro. It’s awesome in my hometown, that the crowd have come out in full support – hopefully they do so for the Super Smash final as well. Rohit Sharma, India captain: Pretty disappointing to not get to the finishing line. 210-odd was always going to be tough, and we were in the game right till the end, but New Zealand held their nerve well and they deserved to win. We started off well in the ODIs, and the boys will be disappointed not getting to the finishing line in the T20s. Lots of positives, and a few mistakes, so there’s a lot of material to move ahead. It would have been nice to win the series and go home and play Australia, but unfortunately we couldn’t do that. 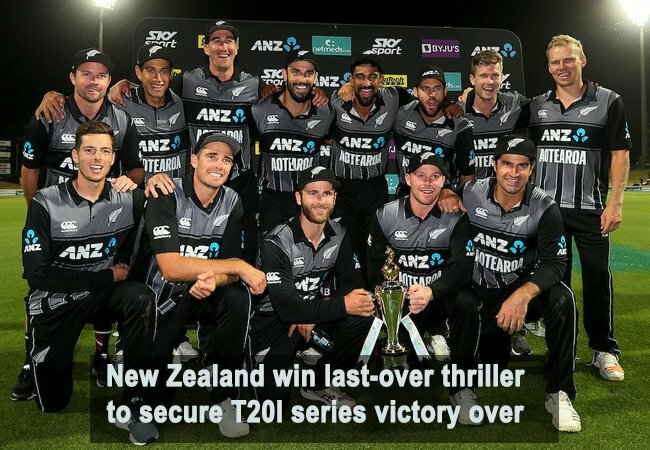 Kane Williamson, New Zealand captain: What a brilliant advertisement for T20 cricket. It’s great to get across the line tonight. It was a fairly short series. The first performance (first T20I) was our best, and there were some learnings in the second one. We knew India would come back strong. For it to go to the last couple of balls with the series on the line, it was a great series to be a part of. We go to the ODIs against Bangladesh – we travel, train and play, so that’s the (hectic) nature of international cricket I suppose.